My birthday is this Saturday! Gonna be 22, woo woo! Doesn't seen possible. 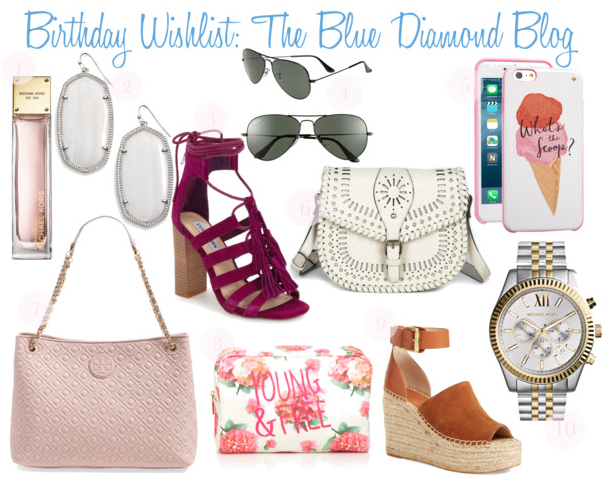 Anyway, I rounded up a little Birthday Wishlist with some cute Spring stuff! I received a roll-on in this scent this past Christmas and really liked it! It smells SOOO good! To this day, I do not own anything Kendra Scott and it needs to change! Love these earrings. I am loving the lace-up sandals everywhere this season! The purple suede is so pretty! Ever since Trey bought me my first pair of Ray-Ban aviators last year, I knew the next pair I would get would be all black, love these! Isn't this the cutest phone case!? Kate Spade always has the cutest cases! The laser cut detail in this bag is so cute. It is the perfect cross body for spring & summer and it also comes in cognac as well! I have been on the lookout for a light pink tote. This one is absolutely gorgeous! The floral print on this makeup bag is so cute! And its only $8.90! Seriously, these wedges are adorable! They would be so cute with a dress or distressed shorts and a flowy top....adorbs! I have had my eyes on this watch for so long! I just haven't made the purchase yet! I love the silver and gold tones together. It is different than any other watch I own.